Moving the Needle: Luis Rodriguez walks off with a single, +.782 WPA. 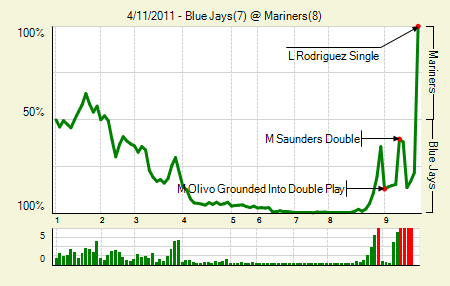 For the first seven and a half innings this looked like another game where the Mariners’ offense would fall flat. It’s all too common a story these days, and apparently the Mariners were sick of hearing it. Rodriguez started things in the eighth by drawing a bases-loaded walk. Two of his teammates apparently thought that was a great idea and did the same. Heading into the ninth they still trailed 7-6, but a Michael Saunders leadoff double got things started. Shawn Camp didn’t deliver a bad pitch, but Rodriguez went down and crushed it into the gap in right-center. It would have been an easy double, maybe a triple, if Ichiro didn’t score so easily on it. Justin Smoak: 2 for 3, 1 2B, 2 BB. He’s off to a nice, albeit homer-less, start, with more doubles than singles to this point. He also has more walks than singles. Corey Patterson: 2 for 5, 1 HR. Notable because not only does it mean Corey Patterson is still playing baseball, but that he’s hitting second. Moving the Needle: Michael Young breaks the scoreless tie in the seventh, +.227 WPA. Through six I was convinced it was the Tigers who would break through in this one. Justin Verlander was on an absolute roll, retiring 18 of 19 batters faced through six, the lone hit coming off the bat of Josh Hamilton. In the seventh, Hamilton became the Rangers’ second base runner, walking with one out. Adrian Beltre followed with a single, and Young brought around the game’s first run with an opposite field double. 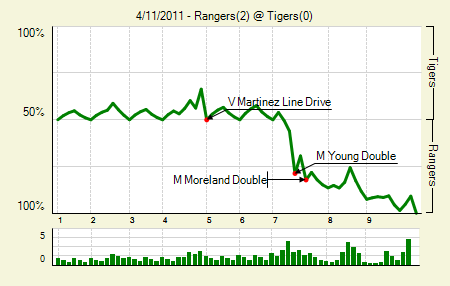 Mitch Moreland followed with an RBI double of his own, which gave the Rangers enough of a cushion in this one. Verlander completed the game, but, with no support from his offense, his effort was for naught. Miguel Cabrera: 2 for 3, 1 BB. His one-out double in the fourth put runners on second and third with one out. Unfortunately, Elvis Andrus made a nice catch on a Victor Martinez liner, doubling Cabrera off second and ending the inning. Alexi Ogando: 7 IP, 2 H, 0 R, 1 BB, 4 K. Both hits were to Cabrera, making this start look even more impressive. 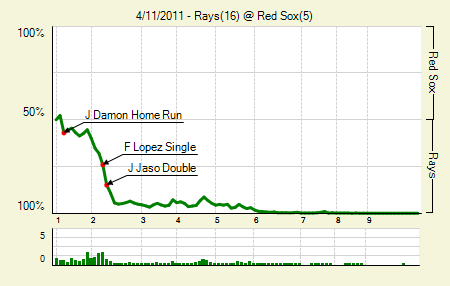 Moving the Needle: John Jaso opens up the game, +.109 WPA. In a blowout like this, the WPA swings don’t mean much. Sure, Jaso’s double off the base of the Green Monster was pretty, and it did put the Rays up 3-0 with runners on second and third with no outs in the second. But this game contained some far better stories. Sam Fuld, for instance, is so full of grit and hustle that, when needing a single to complete the cycle, he doubled again — and made a catch that, while perhaps not as spectacular as his run-saving grab on Saturday, was still a marvel to behold. The Rays as a team picked up the pace, 44.4 percent of its runs for the season in this single game. Hell, another four-spot on Dice-K and they would have matched their previous nine games. For even more crazy antics: both David Ortiz and Adrian Gonzalez tripled. Johnny Damon: 3 for 5, 1 HR, 1 BB. I had a friend comment yesterday that Damon’s bat had slowed considerably. It’s a good thing, then, that he got to face Matsuzaka, who rubs the ball with a compound that naturally attracts maple bats. B.J. Upton: 3 for 4, 1 BB. He still has 18% of his team’s hits on the season. 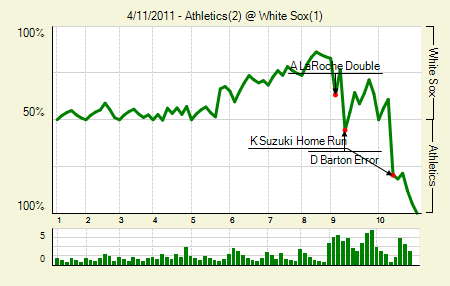 Moving the Needle: Kurt Suzuki homers in extras to put the A’s ahead, +.406 WPA. Through five Mark Buehrle had allowed just one base runner, though he had faced the minimum. Through eight he had allowed just two hits. Yet at 99 pitches, Ozzie Guillen lifted him for Matt Thornton, who is apparently not the closer, but one of “three or four guys who can close.” He might have gotten the job done, too, if it weren’t for Juan Pierre getting tripped up and missing a routine, albeit deep, fly ball. 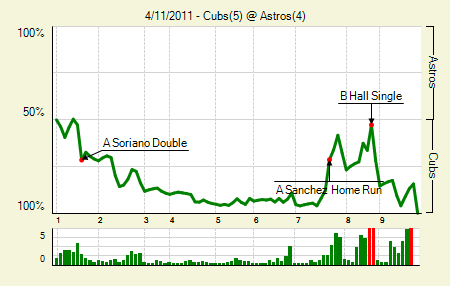 That allowed the tying run to score, which bought the A’s enough time. Suzuki’s homer in the 10th off Jesse Crain was enough, and Brian Fuentes closed the door with a 1-2-3 bottom half. Dallas Braden: 6 IP, 5 H, 1 R, 2 BB, 7 K, 1 HR. A seven strikeout appearance for Braden is always notable. Also, it prompts me to search for Braden’s last seven-strikeout appearance. Turns out it’s not that interesting: last September 23rd against Texas. 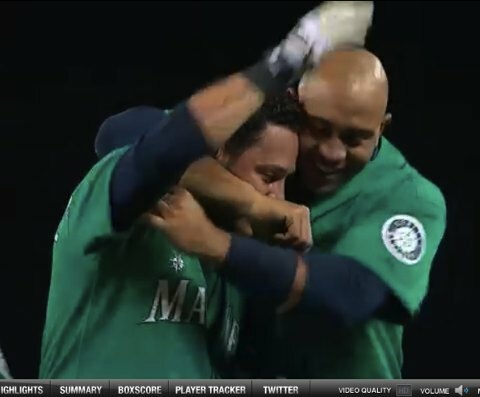 But the search did provide a reminder that Braden did strike out 10 Mariners last April 6th. Good times. Brent Lillibridge: 1 for 3, 1 BB. His homer in the fifth looked to be the difference in this one. Moving the Needle: Our BABIP overlords favor Carlos Gonzalez, +.251 WPA. 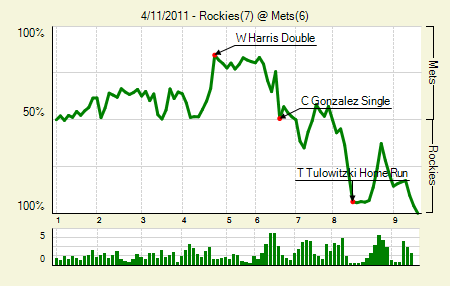 After the play, the Mets stood there in disbelief. Ryota Igarishi delivered the 2-2 to Gonzalez, who was up with two outs and the bases loaded. It appeared to be a perfect changeup, diving down and away. Gonzalez swung, but snapped his bat in two. Yet the ball rolled and rolled, until it left the infield with nary a touch from a Mets infielder, allowing two runners (the tying runner) to score. Gonzalez and his partner in crime, Troy Tulowitzki, would strike again two innings later, sealing the victory for the Rockies. Seth Smith: 3 for 4, 1 2B, 1 3B, 1 BB. A homer short of the cycle. That’s allowed, right? It’s only dumb when we say “a triple short of the cycle,” from what I’ve been told. Moving the Needle: Michael Bourn and Angel Sanchez strike out with the tying run on third, -.327 WPA. Sean Marshall’s strikeout of Bourn actually caused the biggest WPA swing, since it removed the possibility of the tying run scoring on an out. But Sanchez still had a shot. That is, he might have had a shot had Mike Quade not summoned Carlos Marmol for a four-out save. He dispatched of Sanchez and righted the needle for the Cubs. Starlin Castro: 3 for 5. He scored three of the Cubs’ runs and has generally been awesome in his sophomore season. Darwin Barney: 2 for 3, 1 3B, 2 BB. He scored the other two. Plus, I’ll make any excuse to include a guy with the name Darwin Barney. Moving the Needle: Matt LaPorta breaks it open with a three-run jack, +.158 WPA. Welcome to the bigs, Tyler Chatwood. The Angels’ rookie right-hander had it tough right from the get-go. He let the Indians get ahead early by allowing a first-inning solo homer, and then let the game get a bit out of hand in the second. With runners on second and third with one out, he left a fastball out over the plate for LaPorta, who lined it the opposite way. It had enough height to clear the tall wall in right, giving the Indians a 4-0 lead. Chatwood wouldn’t allow a run the rest of the way, but he did walk four in the next three innings, leading to his exit after the fifth inning. Mitch Talbot: 8 IP, 5 H, 0 R, 2 BB, 4 K. He has 11 strikeouts in 12.1 innings this year, which more resembles his strikeout rates in AA than his major league performance last year. Asdrubal Cabrera: 1 for 3, 1 HR, 1 BB. 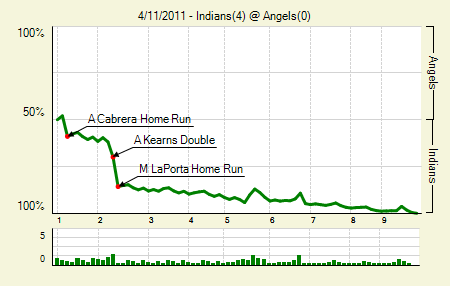 His hot start, especially in terms of power (4 HR, 2 2B), is a big reason why the Indians are off to such a hot start. Moving the Needle: Kyle McClellan doubles home the first run, +.126 WPA. It brings me great joy when a pitcher causes the biggest WPA swing in a game. Normally pitchers inhabit this space only when they’ve surrendered the big hit. The good performances are reserved for the Notables section. But not in the Cardinals game last night. McClellan hit the Barry Enright (see?) pitch a ton, sending it over Chris Young’s head in center to open the scoring. 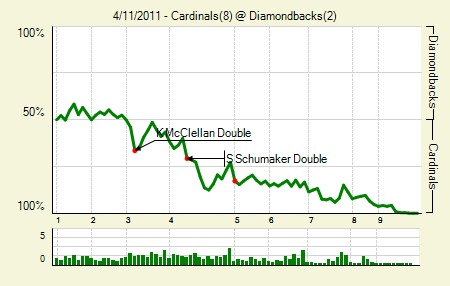 Believe it or not, McClellan also caused the third-largest WPA swing of the day when he singled in the Cardinals’ third run. His performance on the mound was so-so, 6 IP, 1 R, 4 BB, 4 K, but he made it easier on himself with those two RBI. Lance Berkman: 2 for 5, 2 HR. Both were opposite-field shots from the left side of the plate. Berkman has yet to collect a hit as a righty. Moving the Needle: Chris Heisey gets through against Latos, +.326 WPA. In his first start of the season, following a DL trip, Mat Latos looked like his normal self. He struck out seven and allowed just four hits. Unfortunately, one of those hits cleared the left field wall. Heisey took a big rip at a high pitch — it looked like a cutter — and sent it flying out of Petco Park. That put the Reds up 3-2, a score they’d hold the rest of the way. Jonny Gomes: 1 for 4, 1 HR. 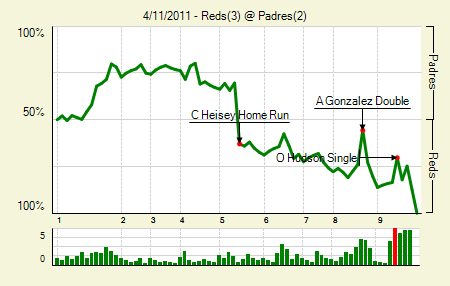 That was the only other extra base hit the Reds managed on the evening. Gomes is off to quite a start, with twice as many extra base hits as singles, plus an NL-leading 12 walks. Moving the Needle: Rod Barajas provides value in the only way Rod Barajas can, +.120 WPA. Barajas does not get on base. Barajas isn’t the best receiver. Then what does he do? From time to time, he’ll sock you a dinger. He did that 17 times in just 339 PA last year, and generally has a quality track record in terms of power. Last night he got a pitch he liked and lined it to left, just clearing the wall and giving the Dodgers their second run. They’d continue piling it on, chasing Madison Bumgarner after just five innings. 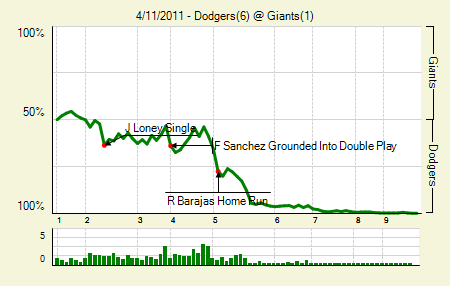 Incredibly, Barajas’s homer was the only extra base hit for the Dodgers on the evening. Clayton Kershaw: 6.2 IP, 6 H, 0 R, 2 BB, 7 K. If I had to pick only one pitcher whose starts I could watch this season, it would be Kershaw. He might not always have it, but when he does, oh my is it beautiful. Pat Burrell: 1 for 2, 1 HR, 2 BB. This was the Giants’ only extra base hit of the evening. We hoped you liked reading The Morning After: Game Recaps for April 11th by Joe Pawlikowski!